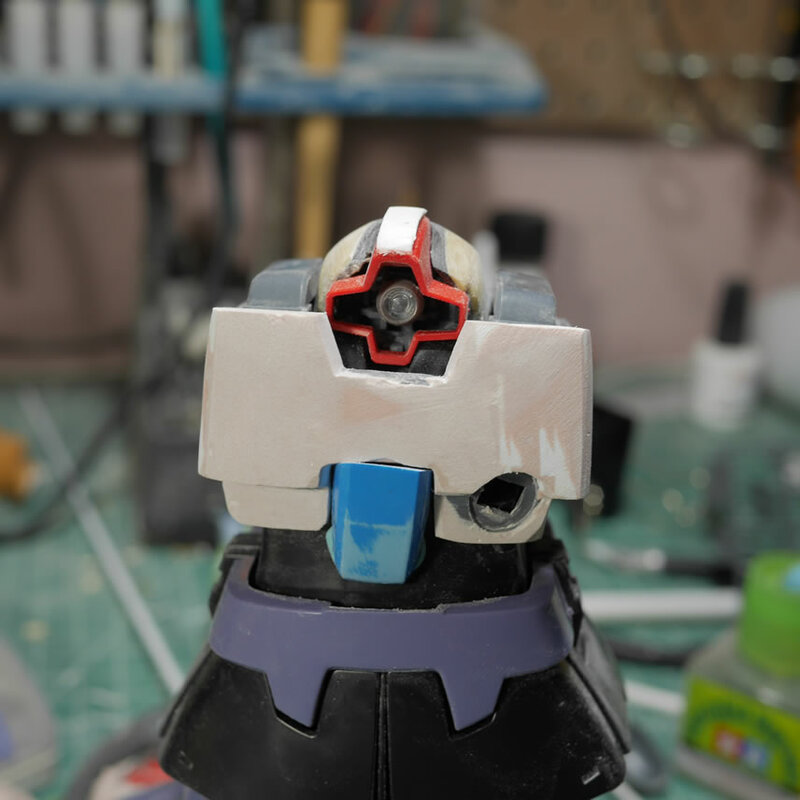 First step is the mess with the head and eyes. 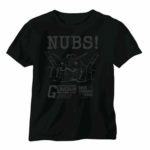 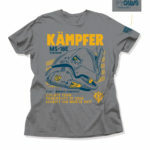 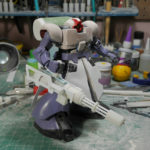 I will be jumping around since things need to cure and such but I’m trying to group sections to things make more sense. 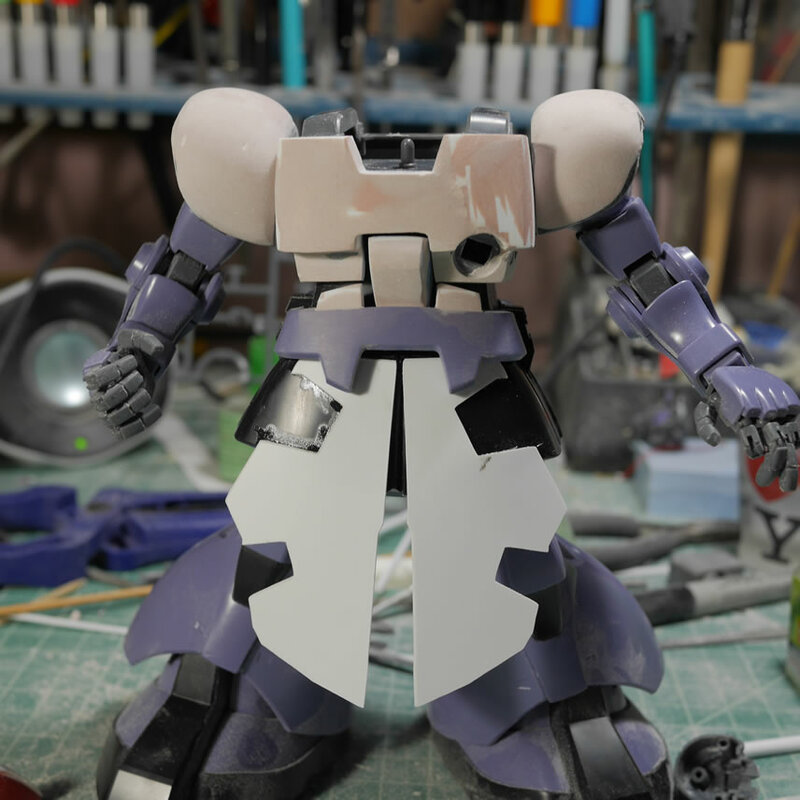 This is almost 2 weeks worth of work so far. 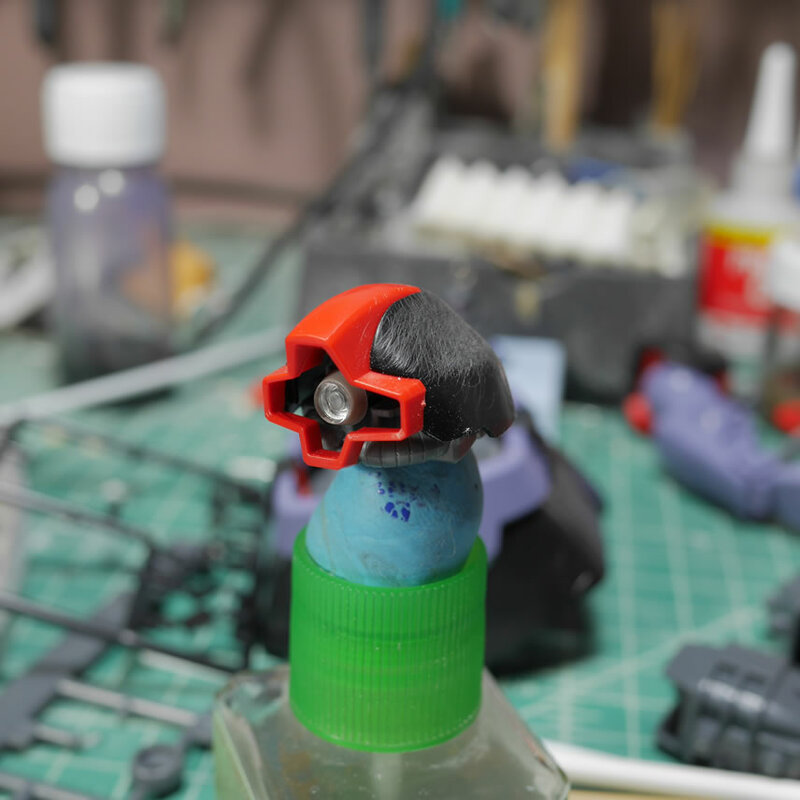 I modded the mono eye with a flat U-venier from wave. 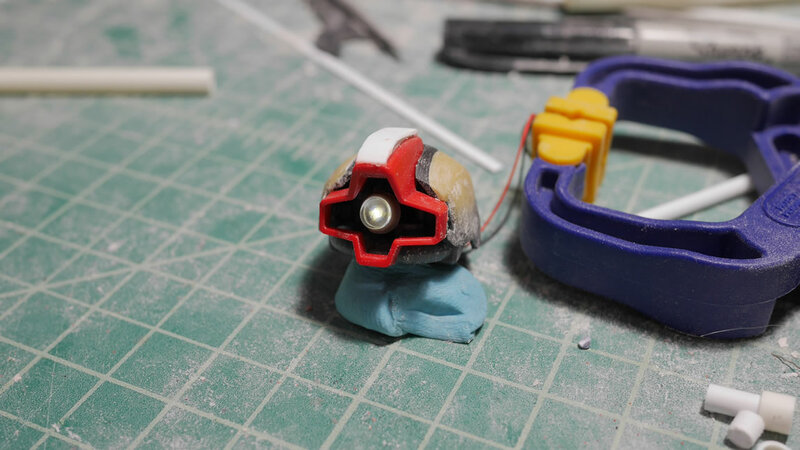 I like to encapsulate the clear eye piece. The head gets a little sanding to rough up the surface. 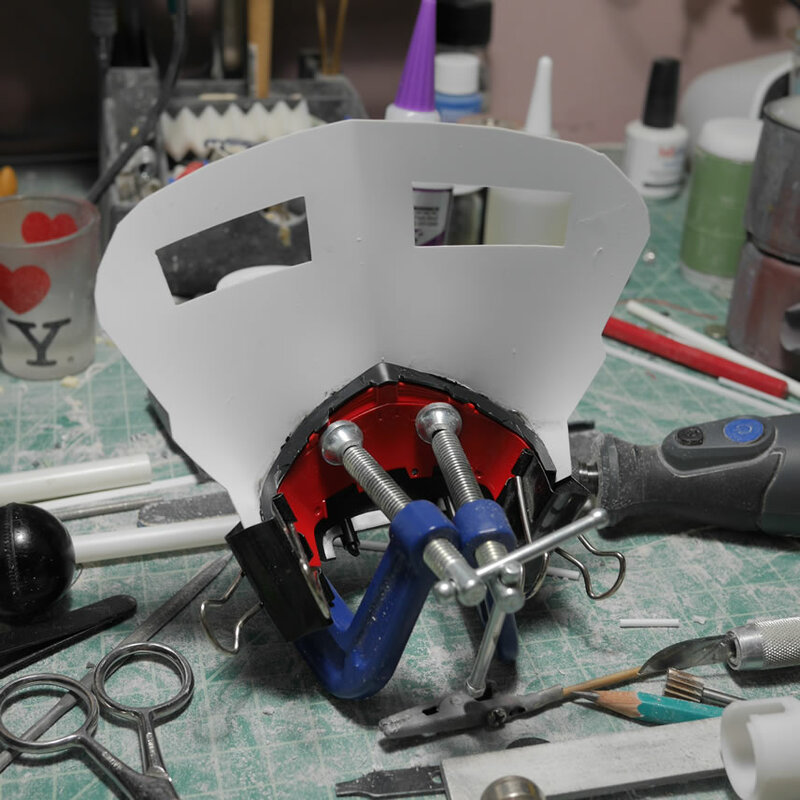 Epoxy putty is laid down to start the process of reshaping the head. 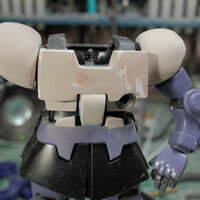 This will probably be the last area I use epoxy putty as I discovered that I would end up needing way too much epoxy putty if I went down this road. Liting the mono eye. 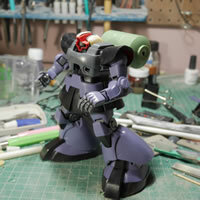 Coming off the HGUC Dreissen size LED mods, I absolutely have to up the game and add LEDs here too. 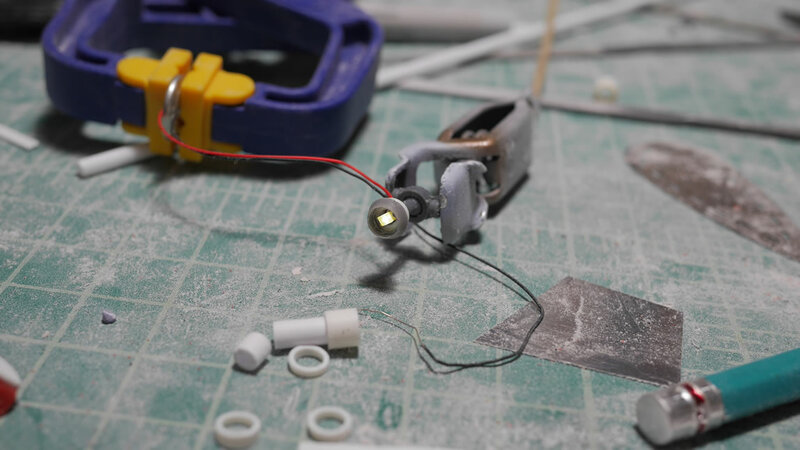 I soldered a white surface mount LED to some wires and using some styrene tubes, added to the back of the mono eye. 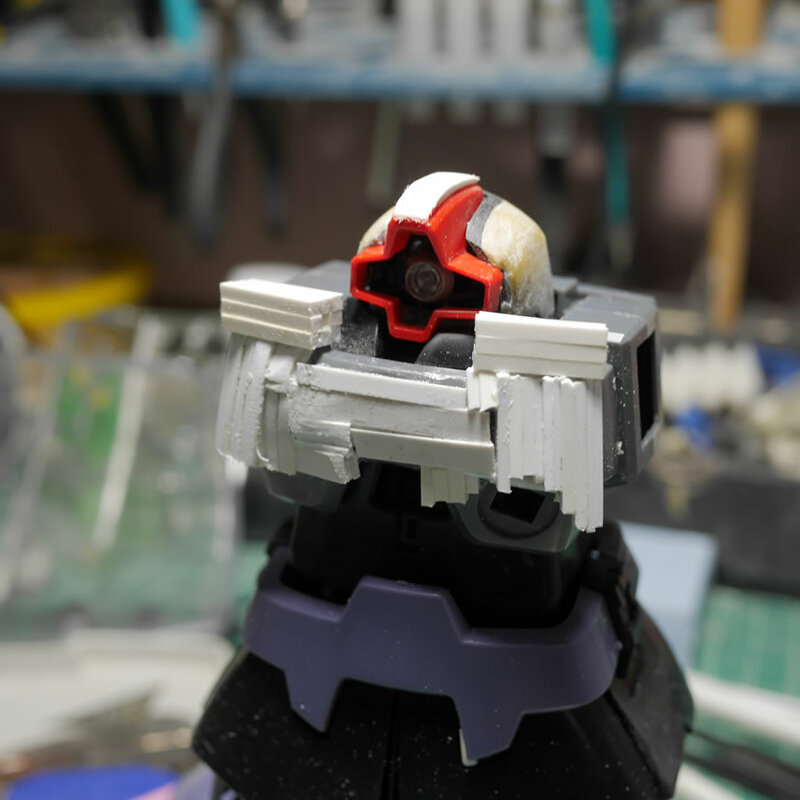 Then attaching this to the Dom’s original mono eye socket and ball joint piece, I now have a lit mono eye that keeps the move function of the original part. 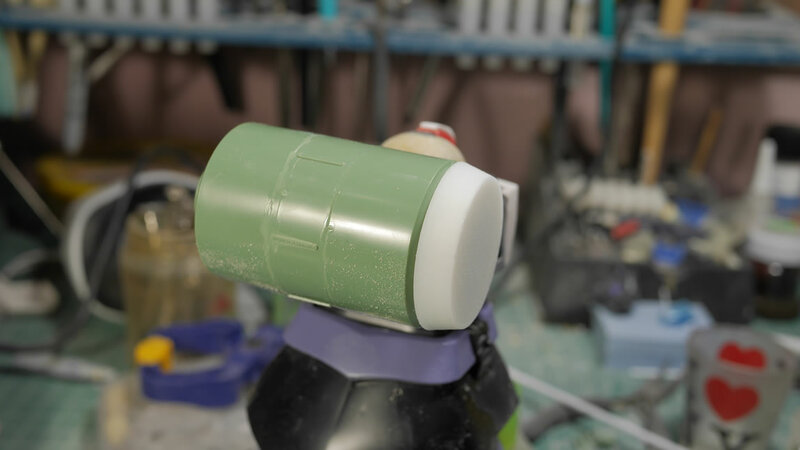 Never be afraid of cutting away plastic. 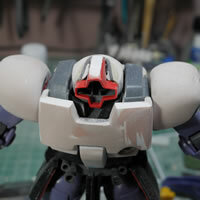 It is only plastic. 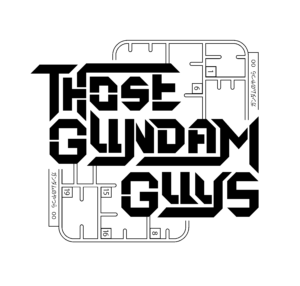 You can always add it back! 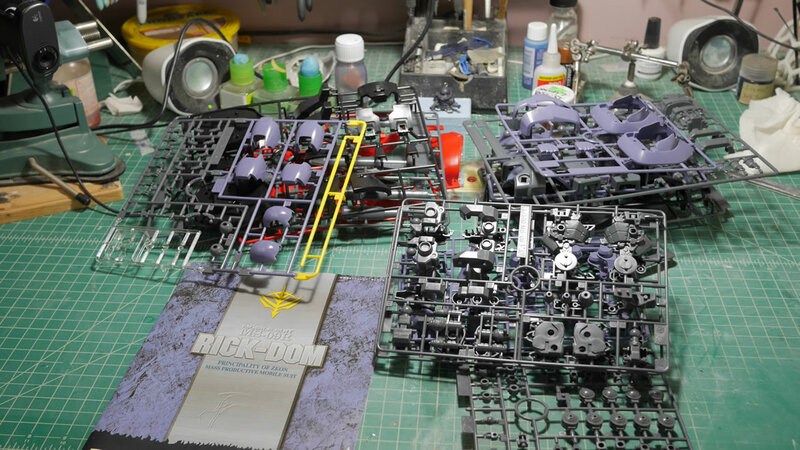 Jumping back to the upper toros. 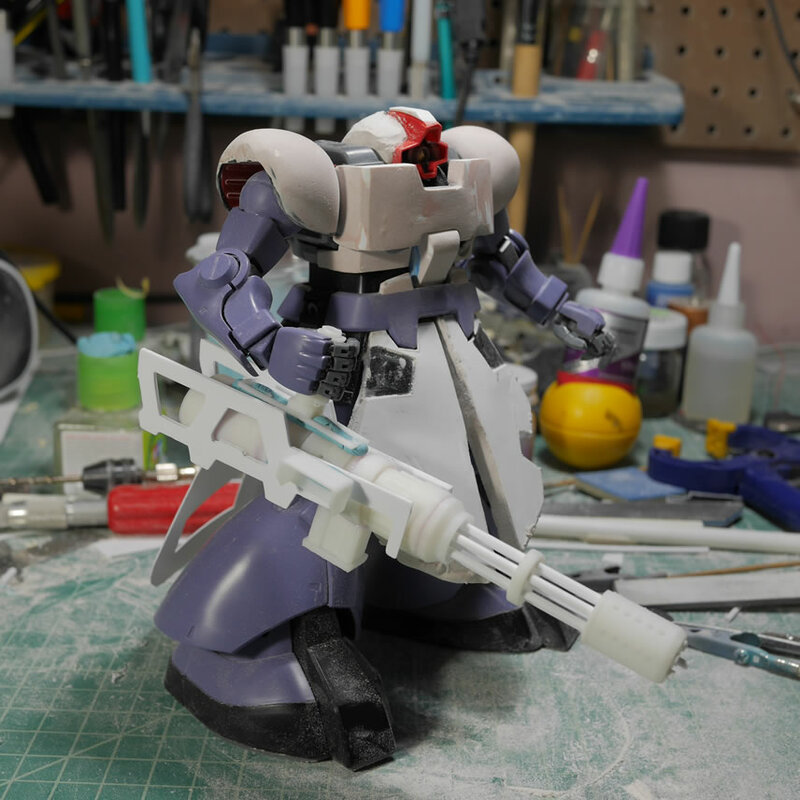 The problem with projects like this is just finding somewhere to start. 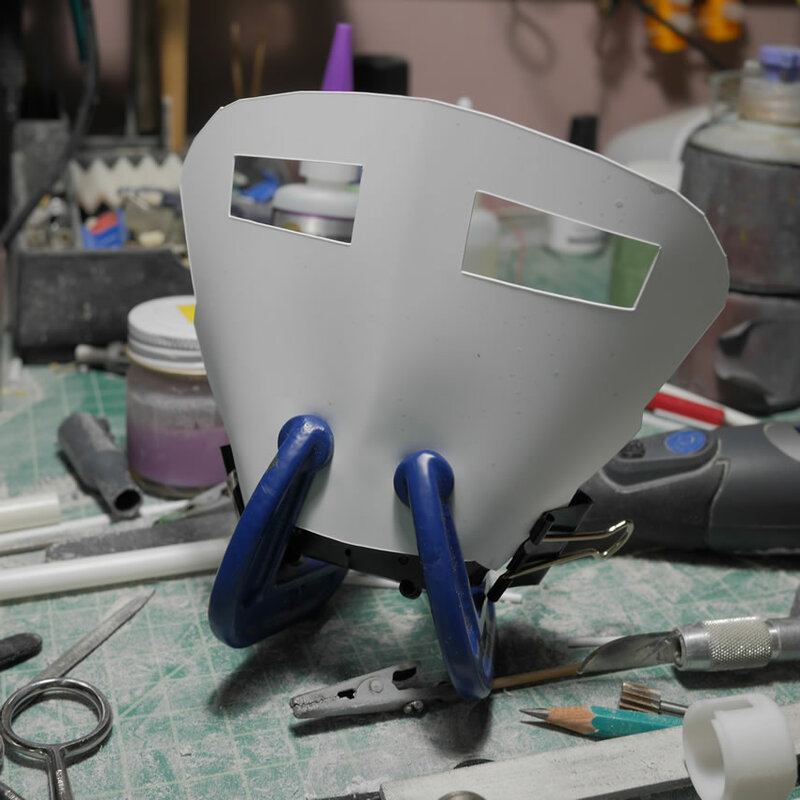 I started with the mono eye because it is small and simple and once that gets going, it is easier to start sliding down the rabble hole. The chest needs some major work to reshape it. I need to add plastic here. 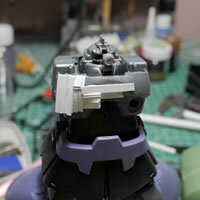 First thing to do is to glue on strips of plastic as a structural unit. Some quick measurements are made and glue is basically poured in with cut strips of plastic. 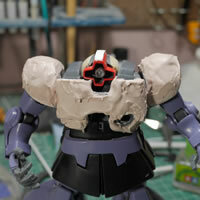 Once I have the basic structure in place, I add in the putty. 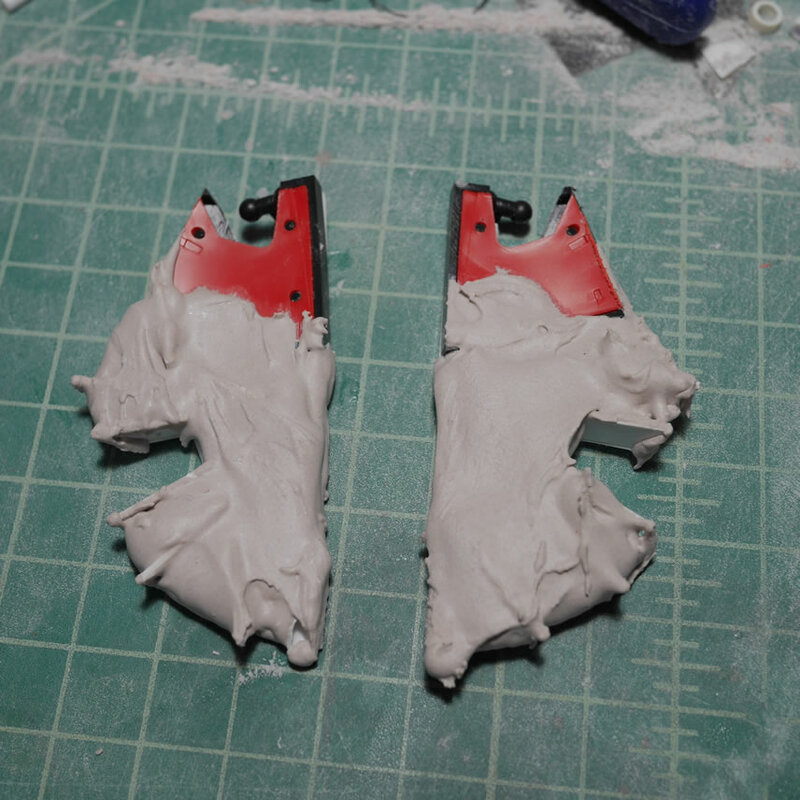 Returning to the original idea that I would be using epoxy putty is completely out of the question. 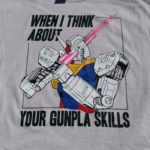 It would just cost too much. 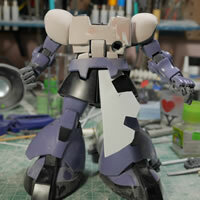 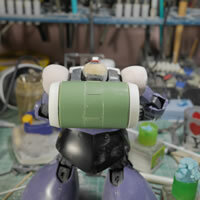 In the past, I have used tamiya polyester putty. 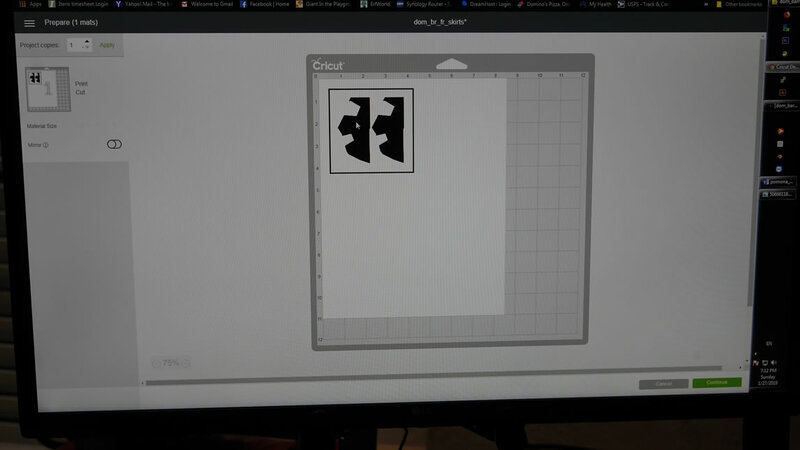 This is great for doing projects like this. 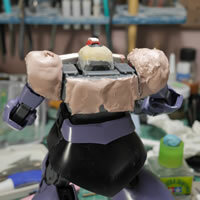 If you look at the linked modeler page above, the builder used some kind of polyester putty for his Barrage too. 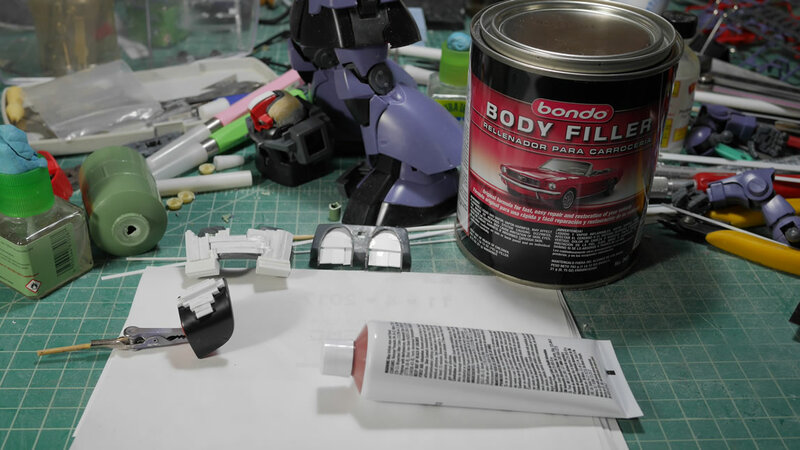 Tamiya polyester putty is a bit expensive for what it is, so time for a cheaper alternative: bondo. 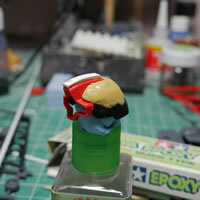 The stuff even smells the same and works exactly like tamiya polyester or mori mori. The putty is applied with a putty knife and pretty much cures and is ready for sanding in about an hour to 2 hours. MUCH faster than epoxy putty quick type. 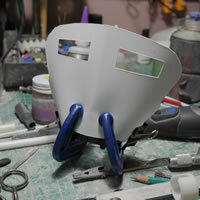 And sanding is MUCH easier. It is softer than resin, so some care is needed to not over sand or be too rough with the sanding. 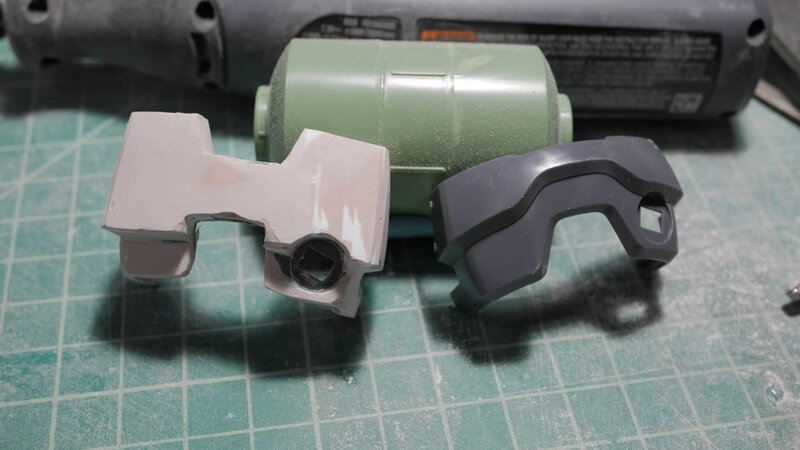 More fine tune sanding to get the basic shapes. 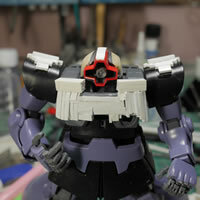 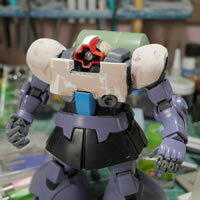 The shoulders are also puttied over glued on plastic strip structures. The putty really needs something to grab. 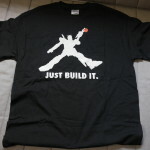 Think of this like pouring concrete without an internal structure. This is not a putty once and done type thing. 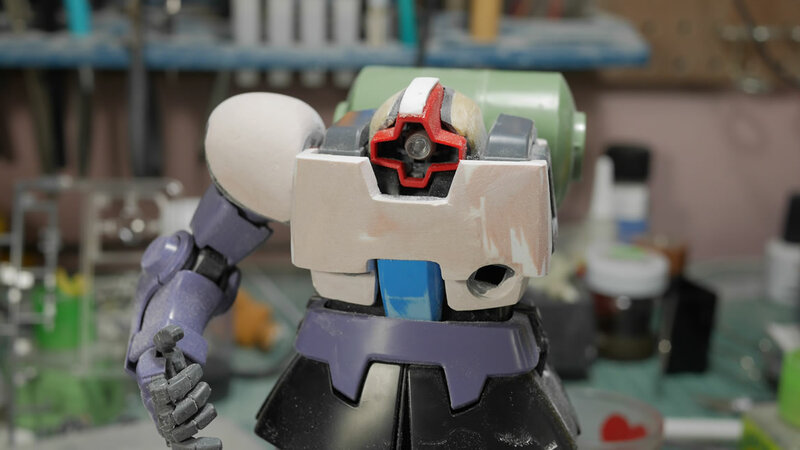 Several cycles of putty, sand, putty sand and then more puttying and sanding will get to something that is close to the reference pictures. 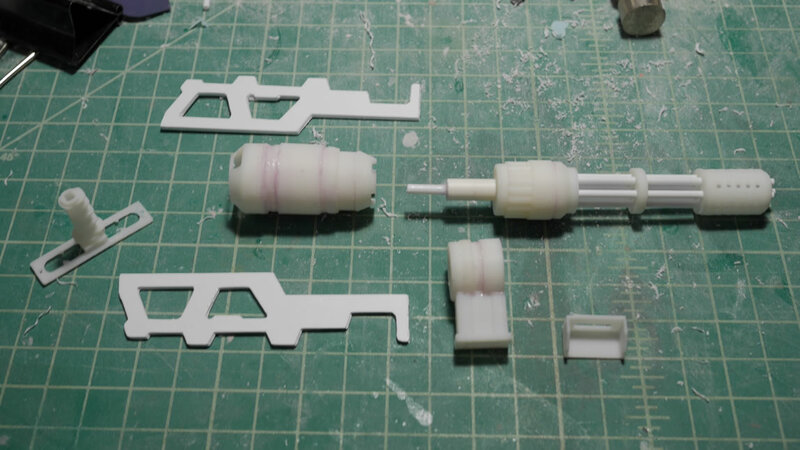 Here’s a comparison shot of the original part and the modified one; again, I have more than 1 MG Dom, so this will make direct comparisons relatively easy as I progress down this rabbit hole. Notice that I added the giant ammo drum. 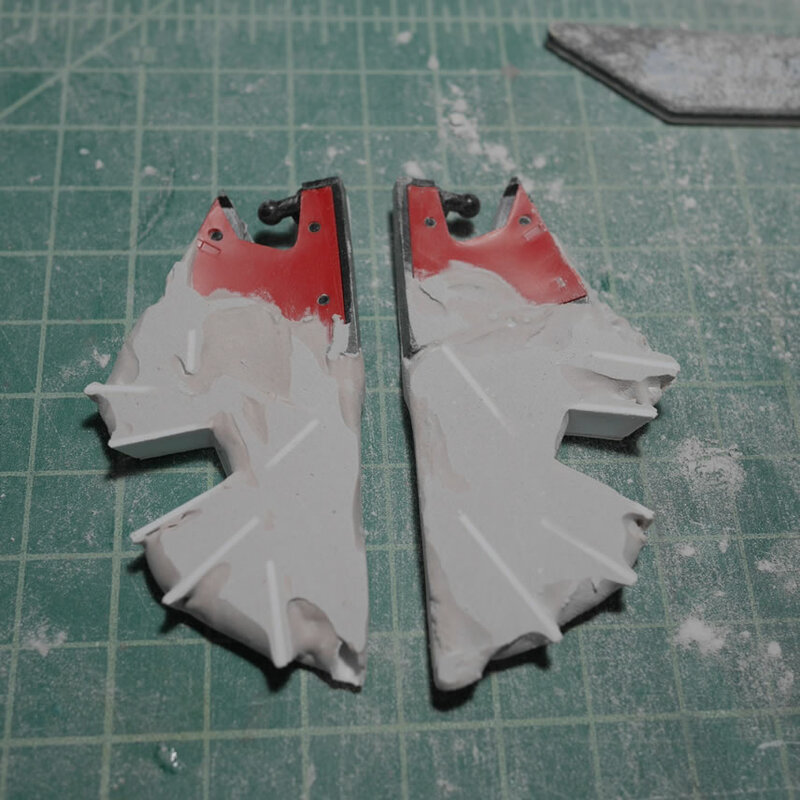 The part is from the Kshatriya Repair that I bought for the Bear Guy project. The kit will not go to waste and I will continue to part it out to various projects. The rear of the Dom’s upper torso was also framed up and puttied. 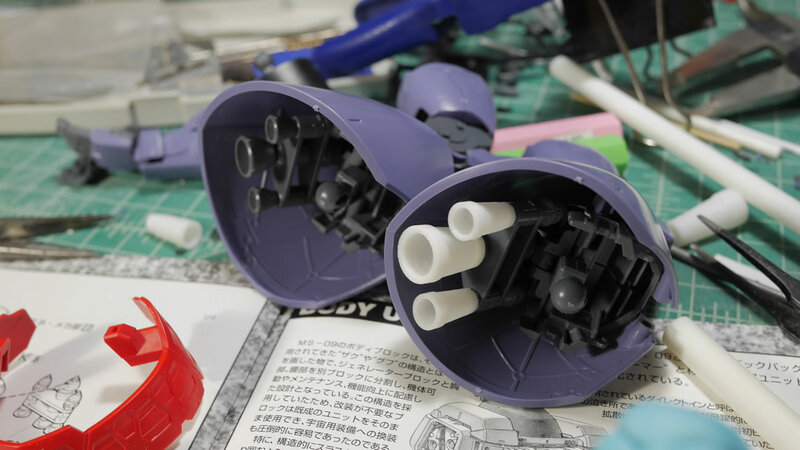 The original thruster molds and ports are filled as they are no longer any use. 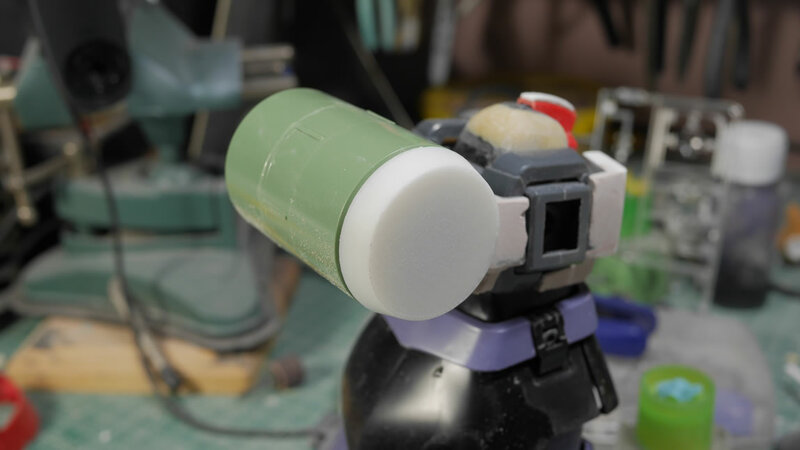 Once sanded, the polyester putty is sold enough that I can drill through it and punch an attachment hole. 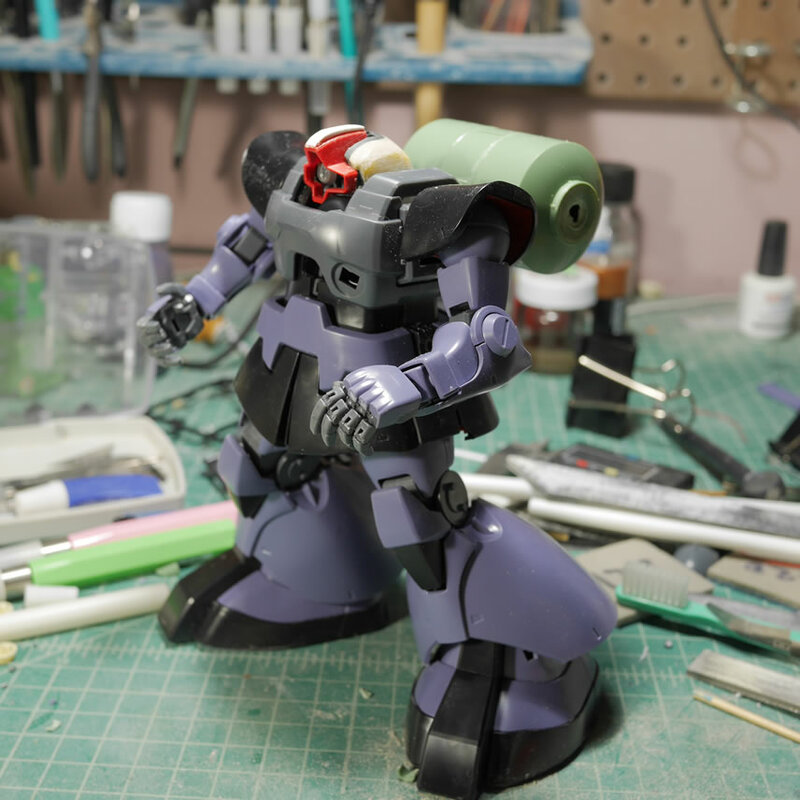 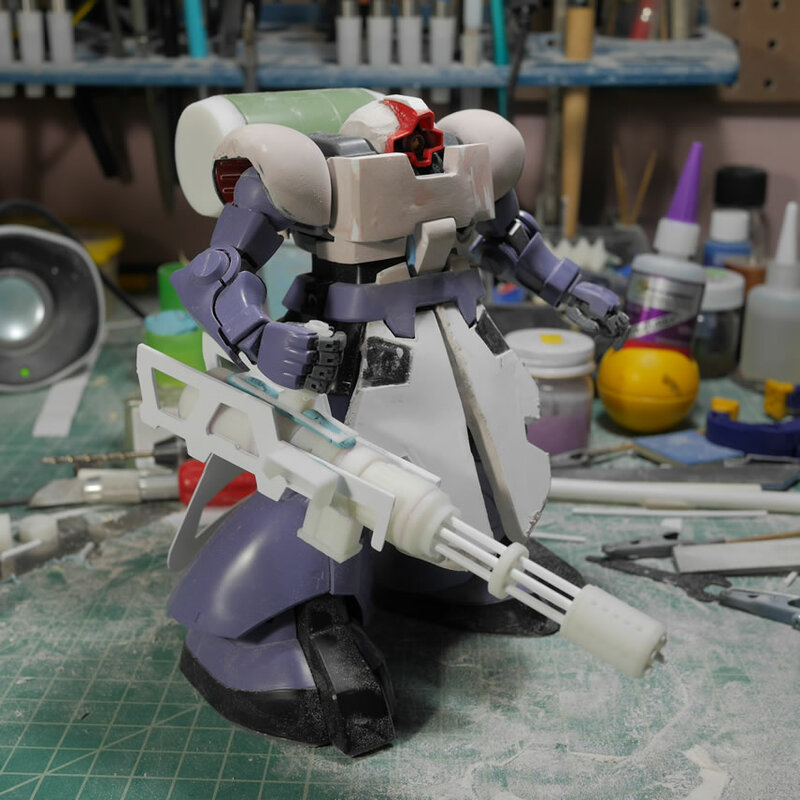 I added a piece from the MG Ball, another kit I grabbed for the Bear Guy project and added an attachment point for the drum. This area of the kit requires some guess work as I couldn’t see completely in where the drum attaches to the backpack. 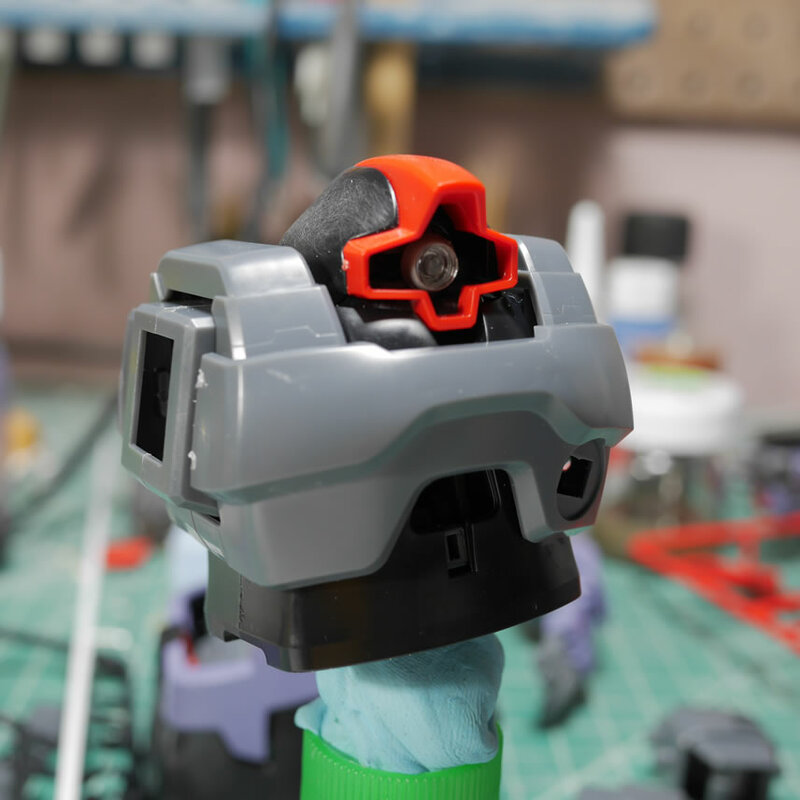 There are 4 attachment points from the upper chest and lower back to the drum, but I just guessed at a center attachment point. 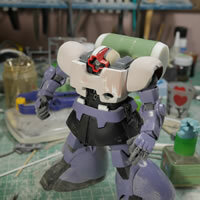 As said earlier, the main drum is built from three round parts off the Kshatriya. 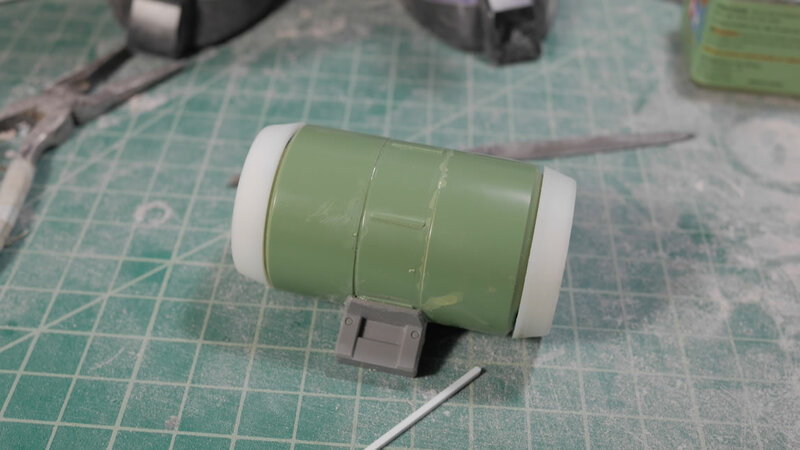 I then designed some quick end caps to the drums to finish off the basic look and feel for the ammo pack. 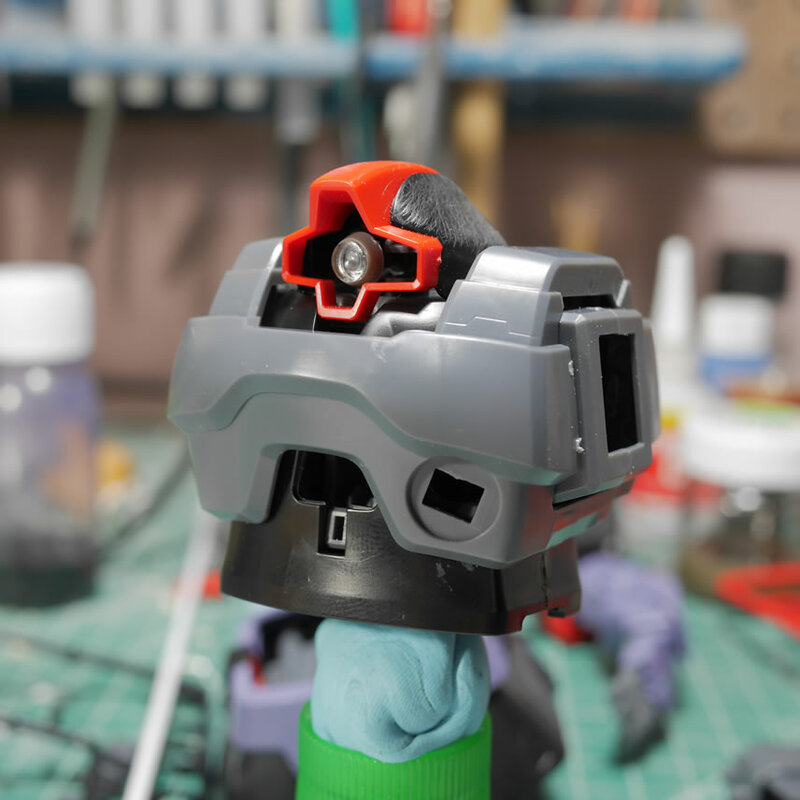 A quick test fit with the parts so far. 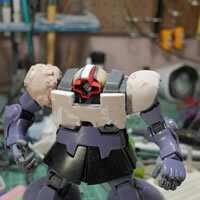 The head is starting to get some sanding but I will definitely need to come back and add more putty there. But things are progressing. The “belt” if you will has been modified to remove the raise middle section that is more inline with the Dom Trop’s belt style. 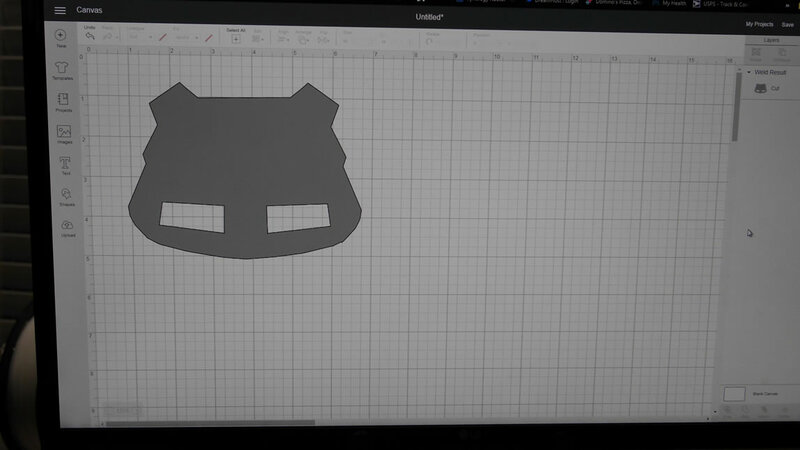 Next up, the front skirts. 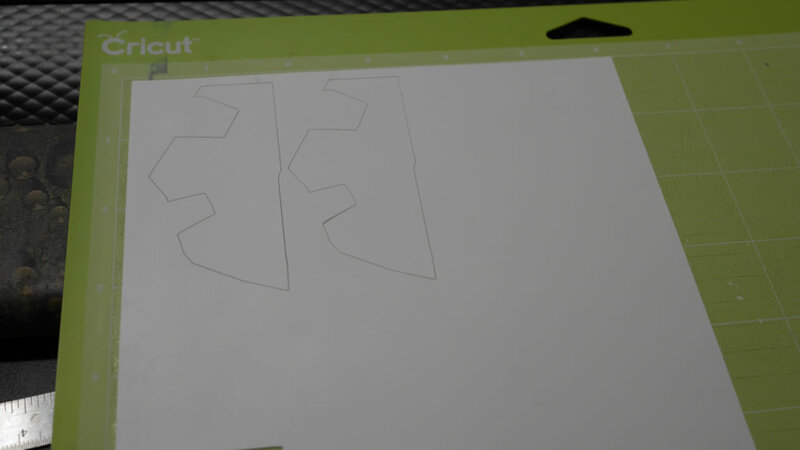 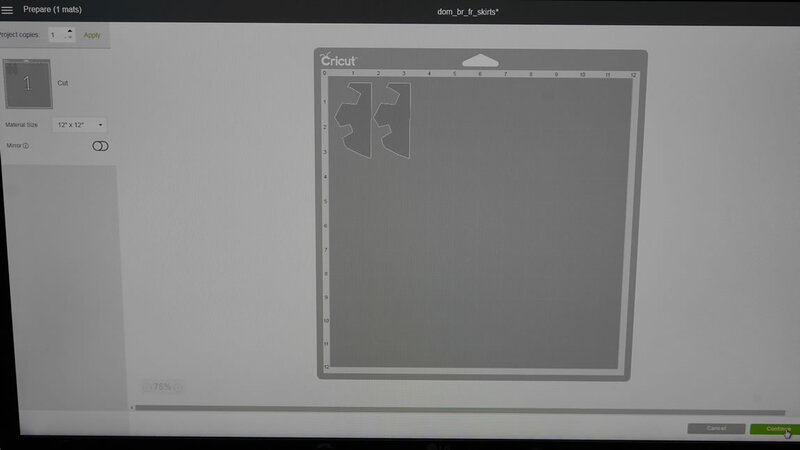 Using the reference screen shots, I drew out the rough shape of one of the front skirts and ported it to the cricut design software to cut the part out of plastic sheet. 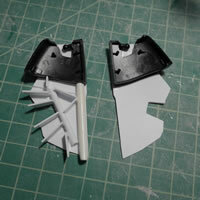 The cutter with the deep cut knife can cut fairly cleaning through .4mm thick styrene. 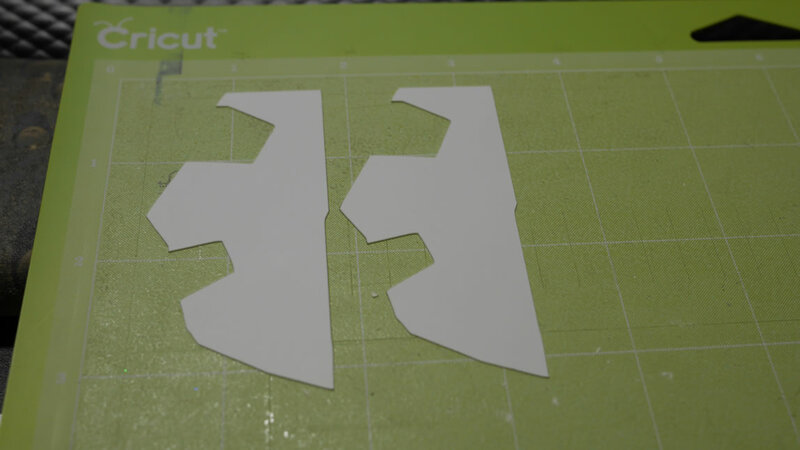 I’m cutting through .2mm styrene for the front skirt so I made 4 copies. I glued two copies together to get a .4mm front skirt piece. 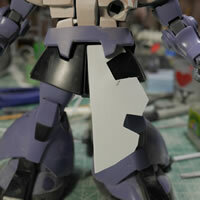 The front skirt pieces are just glued to the original skirt. 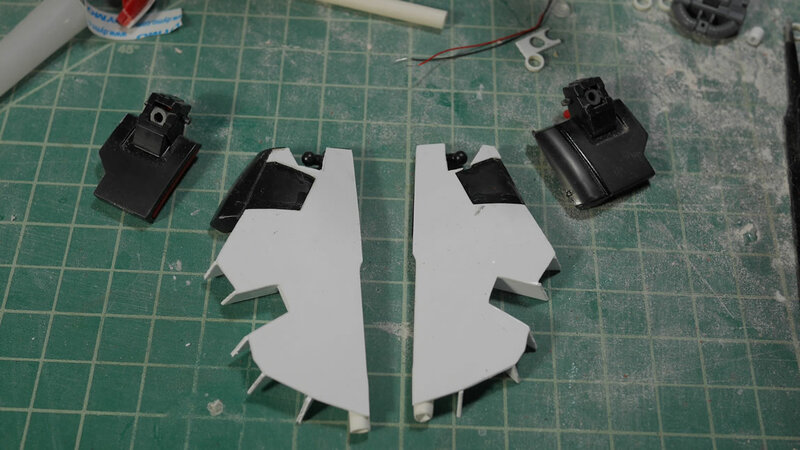 A quick look at the rather thin front skirts. 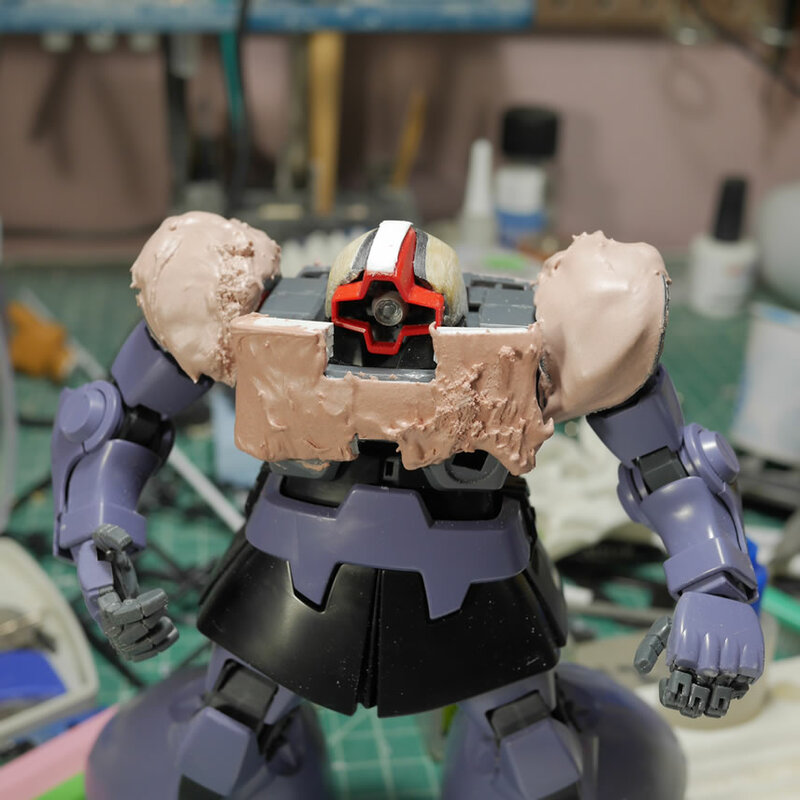 This will be fixed soon enough. 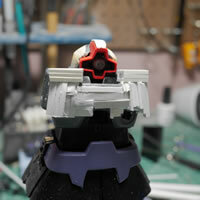 As with everything else so far. As we all need structure in our lives, the front skirts also need structure. 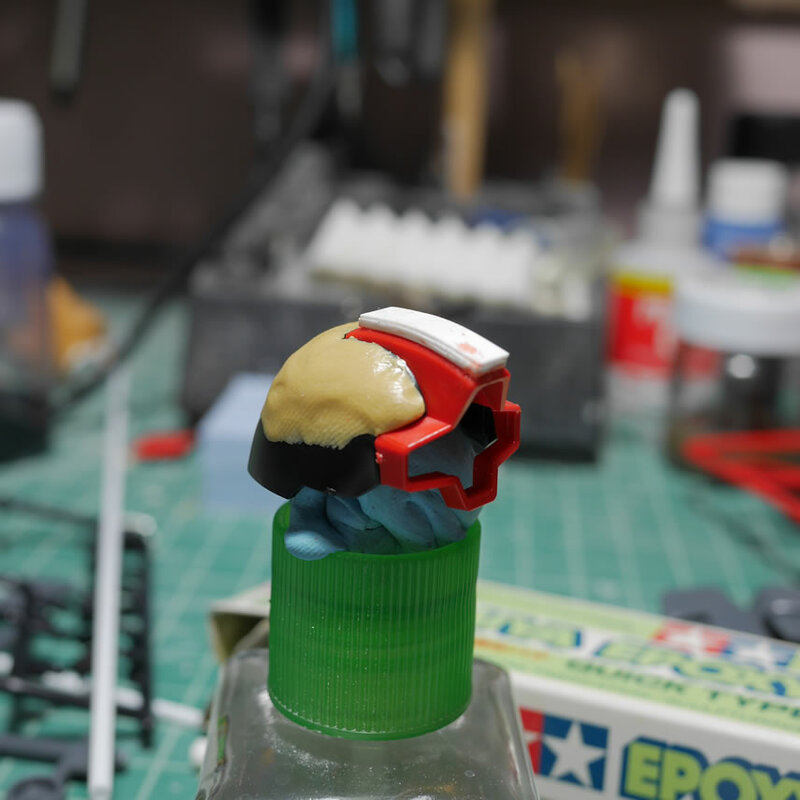 I randomly glue in plastic. 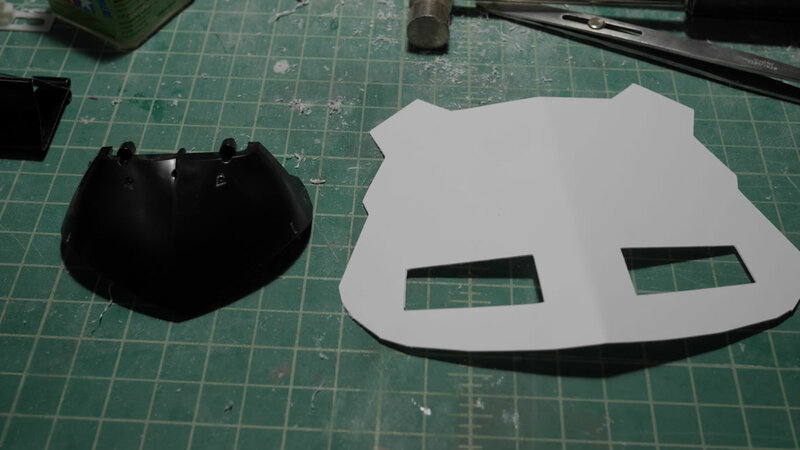 Once this is set, polyester putty is slapped on. 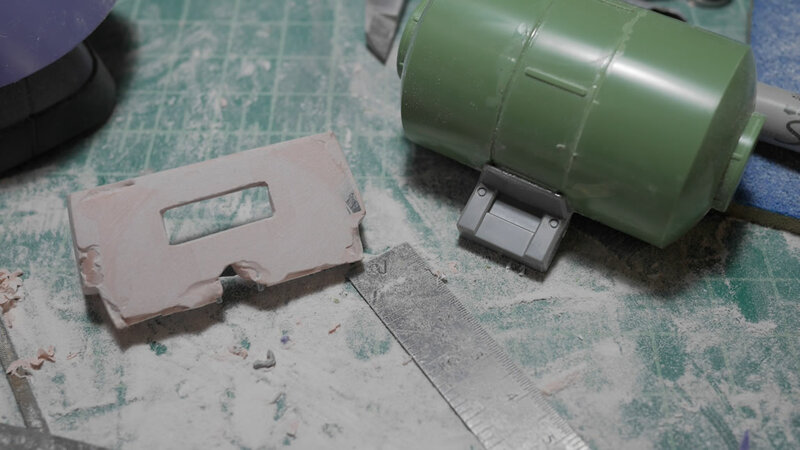 The structure gives the putty something to grab. 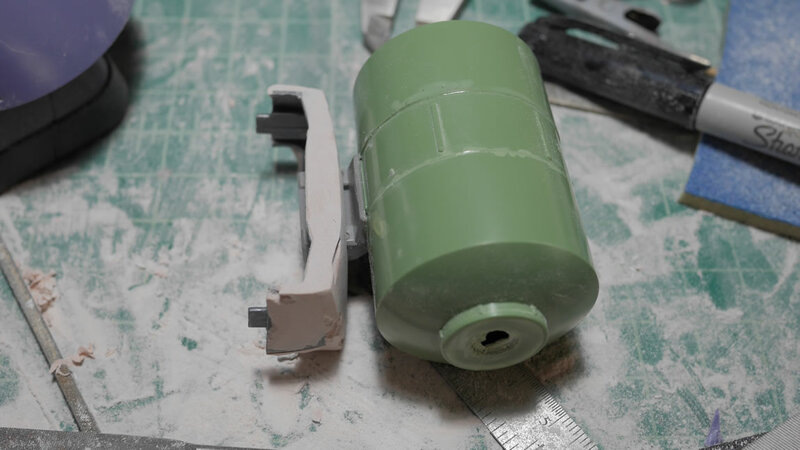 While that stinks up my room, I set it aside to cure and move to the other side of my workshop to design some new thrusters for the back of the lower legs. 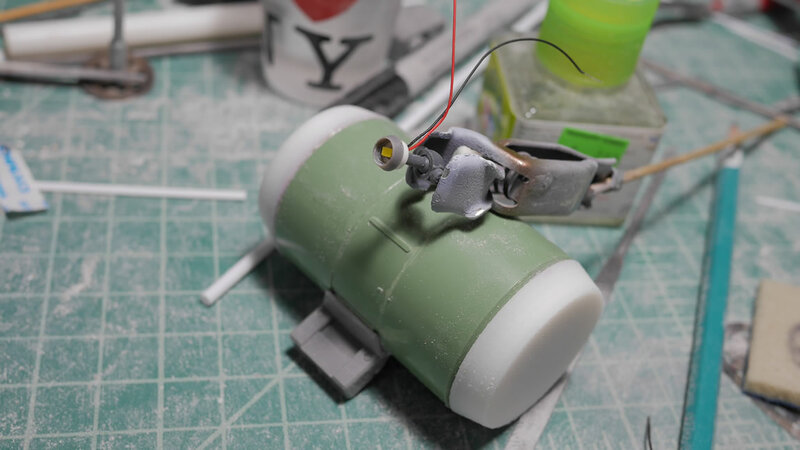 The original thrusters are too short and from the reference pictures, the new thrusters look much longer, so a quick design session on blender and I have new thrusters for the back legs. Continuing on to other thruster work, the back skirts have some massive thrusters. 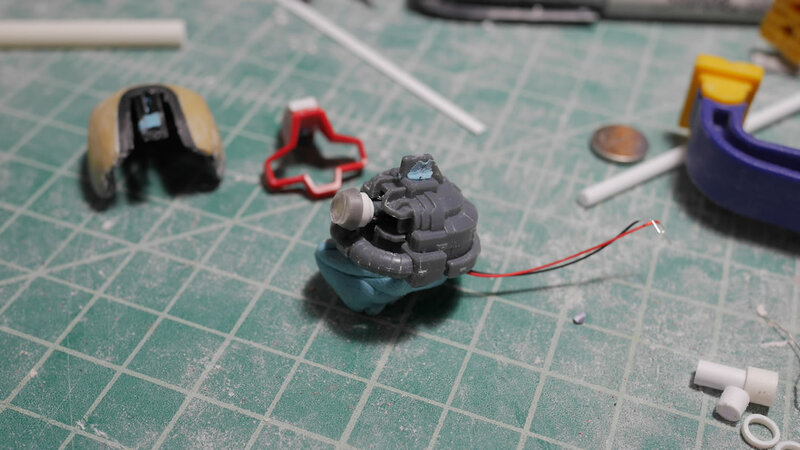 I know that I have some resin copies of metal thrusters to I want to try to see if I can make something work here first before resorting to the 3D printer like the previous (I couldn’t find something that fit, so I had to make some). 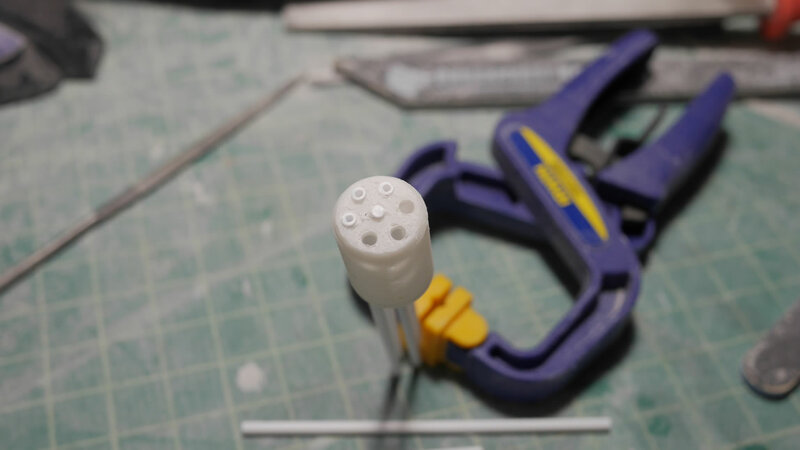 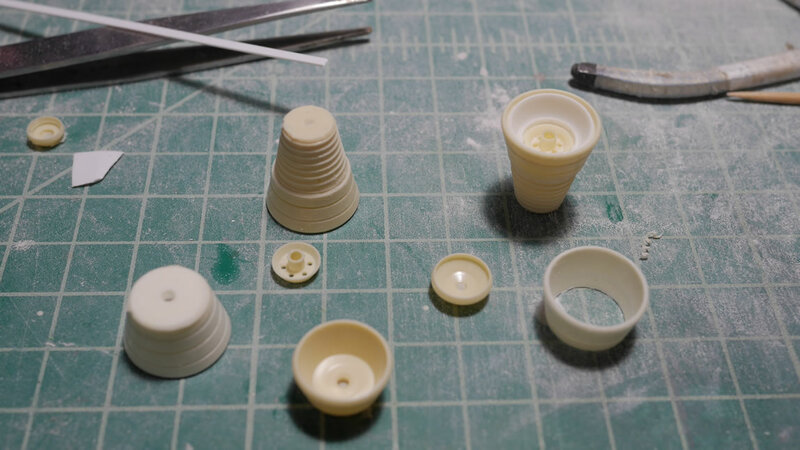 I glued a few thruster bells together and made some more casts of the other pieces. 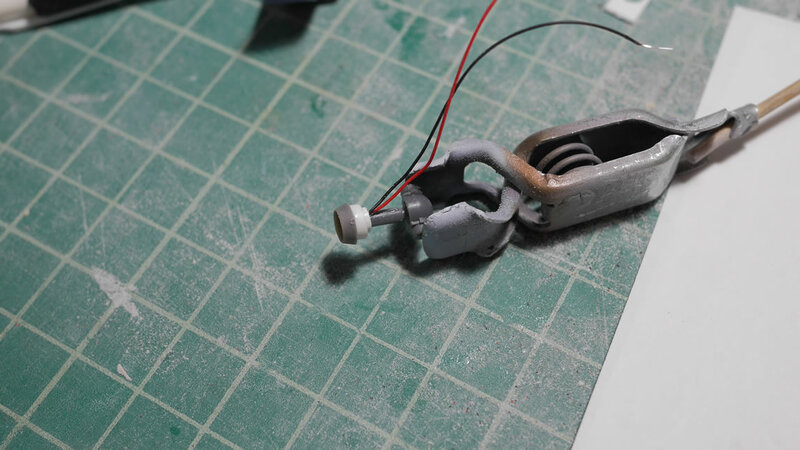 The nice part of having thruster bells with so many different internal pieces is that I can do some interesting things. 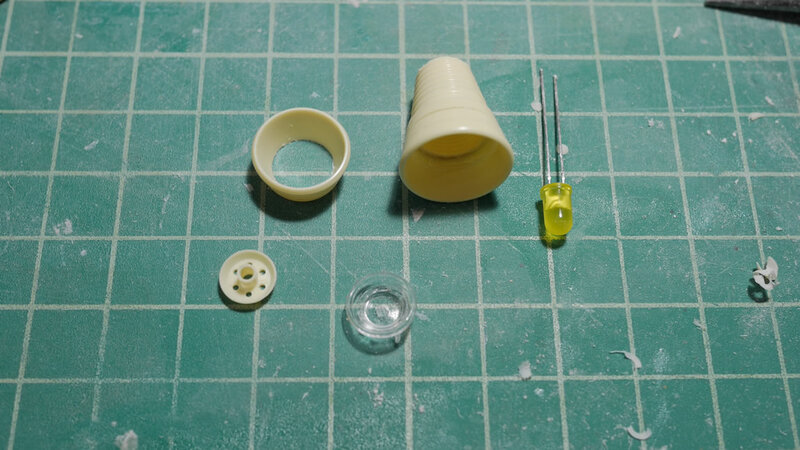 I casted one of the internal bell pieces in clear resin. 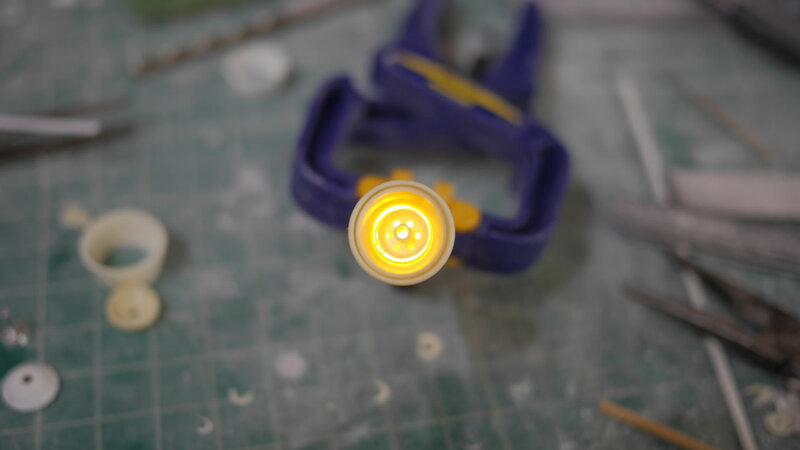 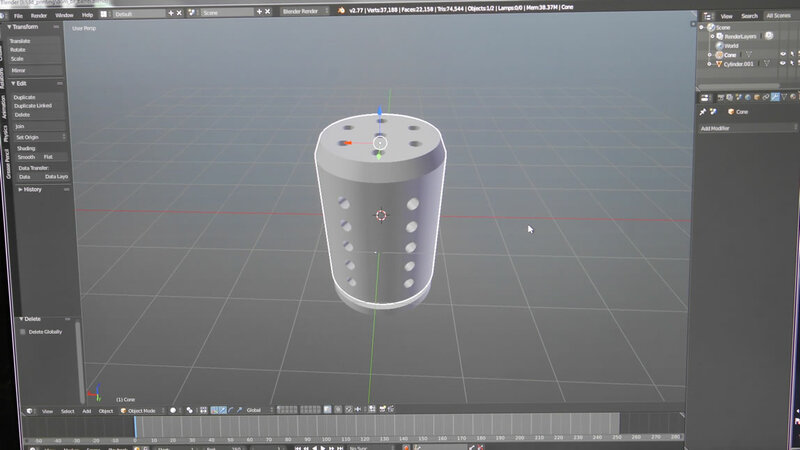 Then assembling them and adding a light at the end of the tunnel, I can effectively create a halo effect within the thruster bell and use the design gimmicks of the center bell piece to allow light through small holes. 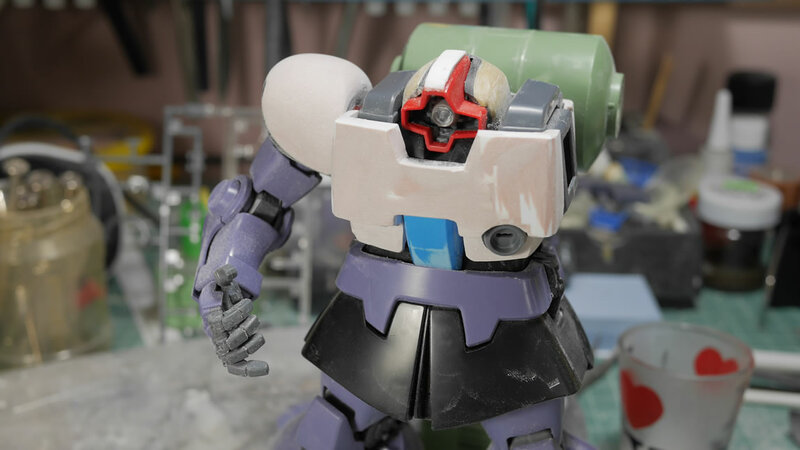 I think this is a pretty cool effect. 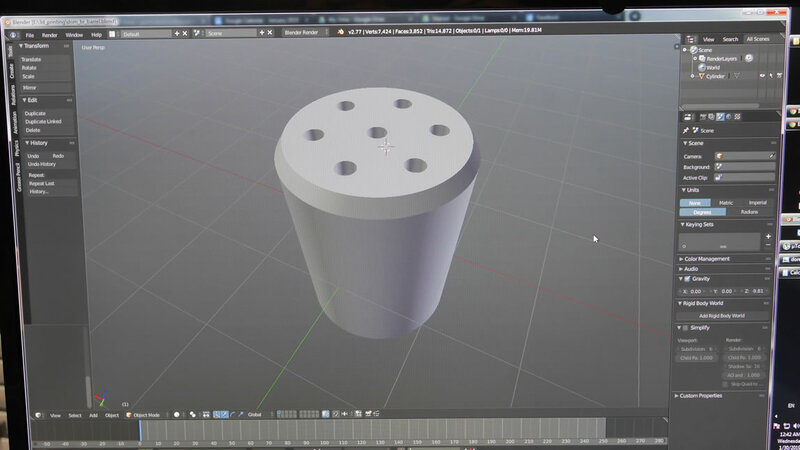 Next up, we go back to blender and design a front gun barrel. 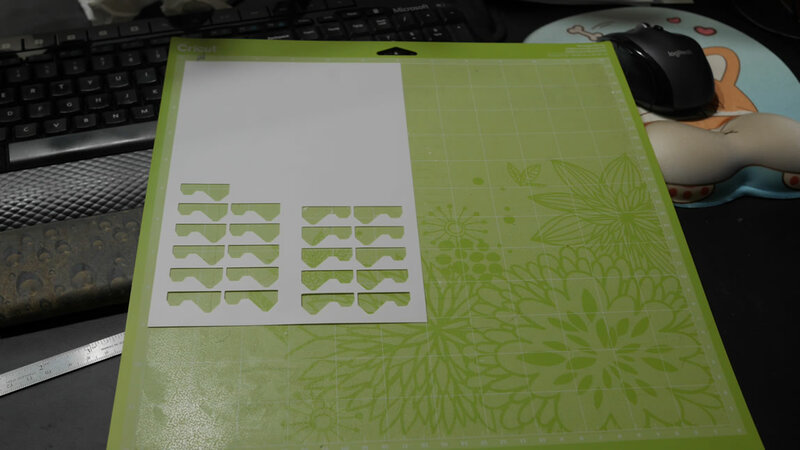 This is much easier than measure and drilling out holes that are completely lined up and spaced evenly. 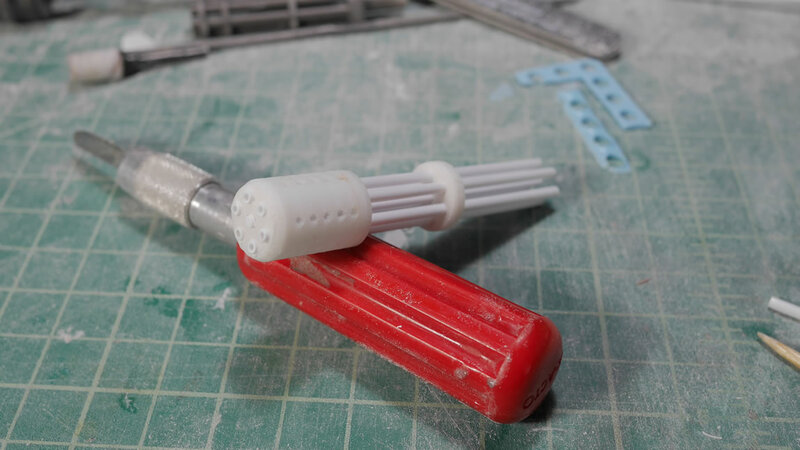 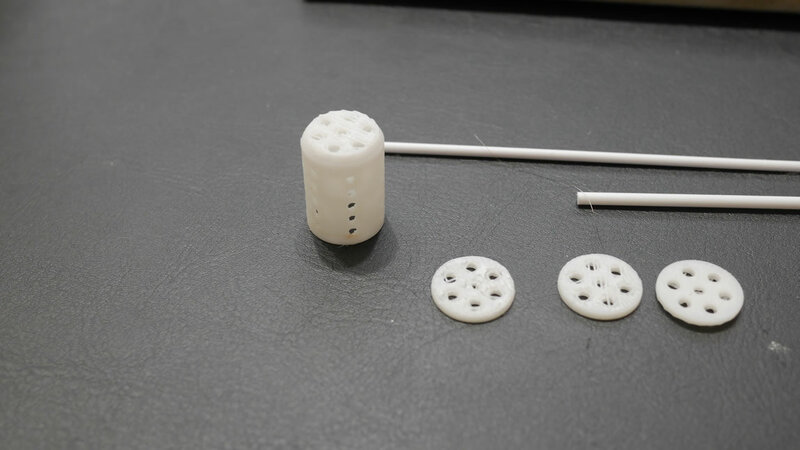 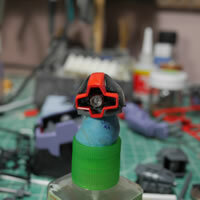 The center structures to the gun barrel are also designed and printed. 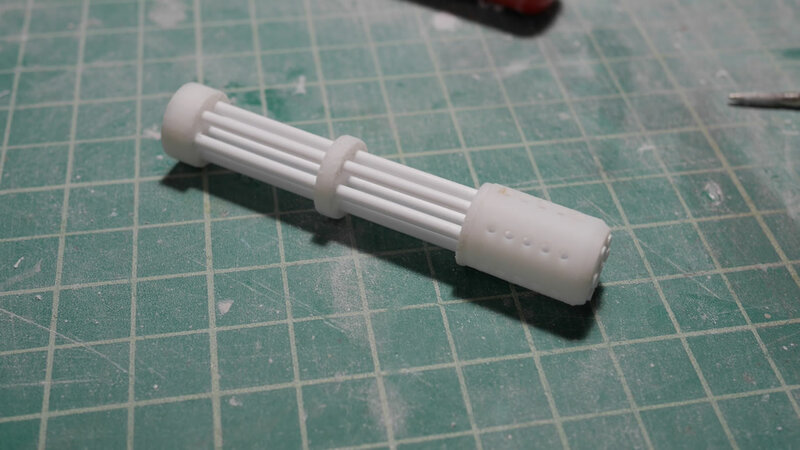 The barrels will be styrene tubes. 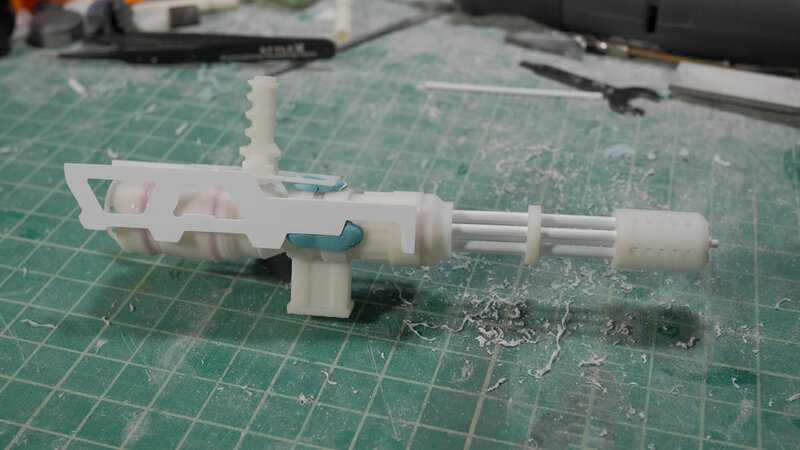 Pushing the tubes and rods through the printed piece I get a general idea of what the first third of the gun looks like. 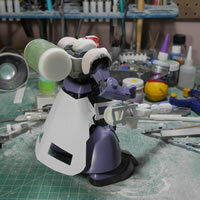 I will make adjustments after I make more reference measurements and modify things as I continue to build. 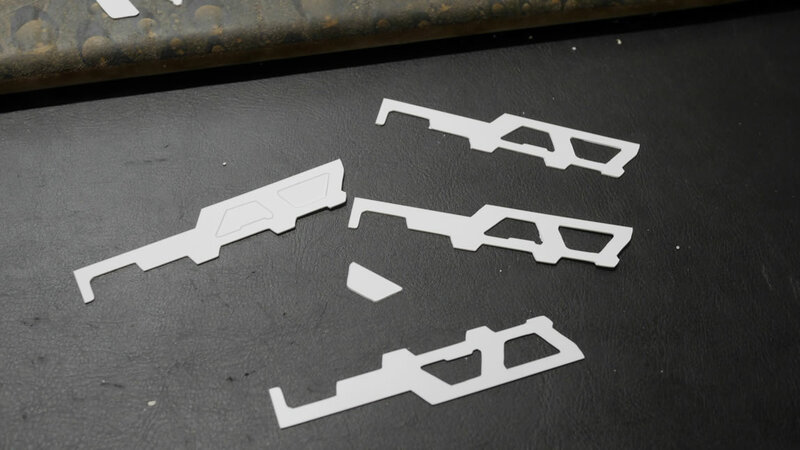 Frame pieces for the gun are designed and cut in the die cutter. 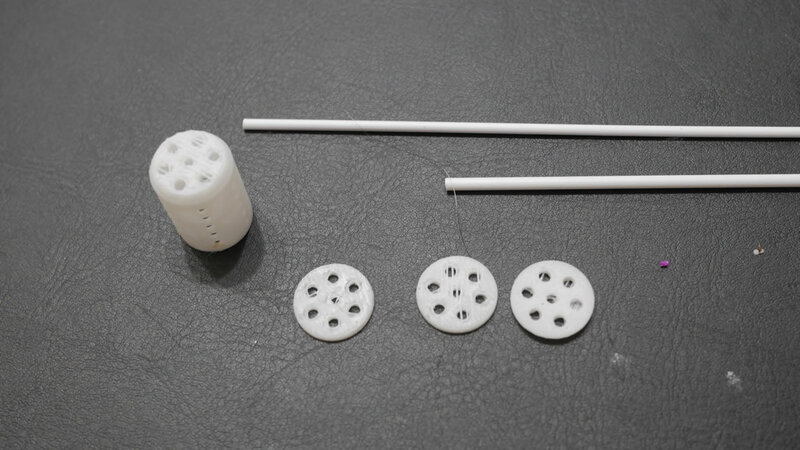 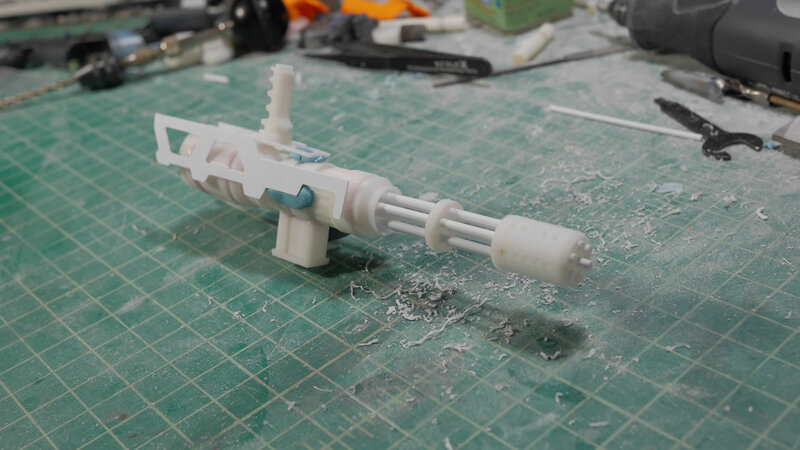 The main gun assembly pieces were all designed in blender and 3D printed. 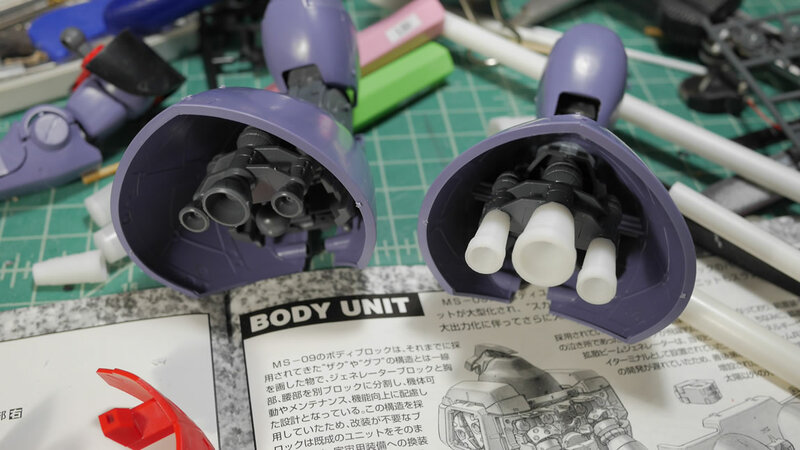 I printed in sections for easy printing and easier assembly. 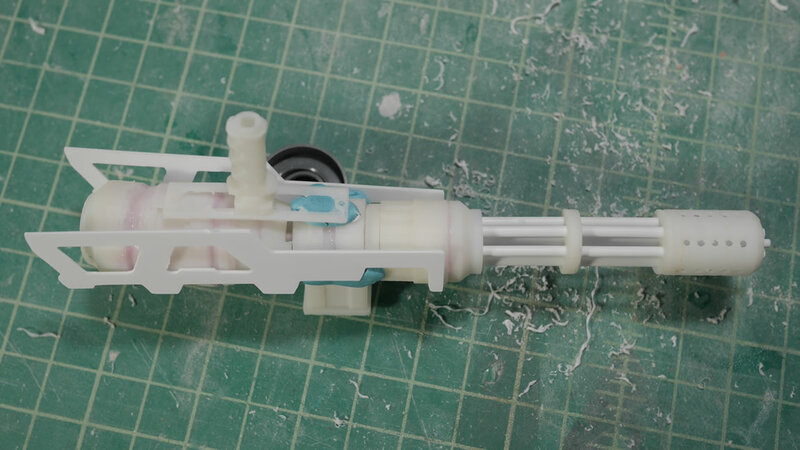 Here is a quick mock up of the gun. 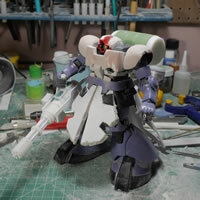 This is very rough, but I get a better idea of where to make adjustments and I have something I can see. 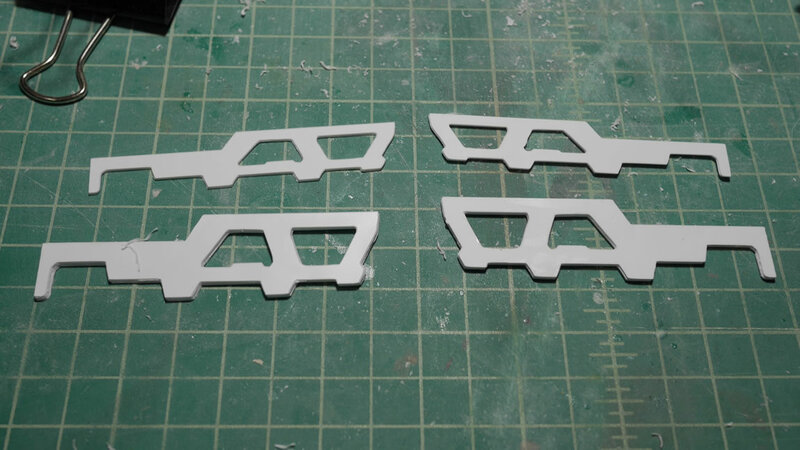 The original frame pieces were a little too small for my liking, so I made some adjustments and cut new ones and here I have all the gun pieces laid out. I designed and printed out the spent shells exhaust port as well as the ammo belt feed attachment point. 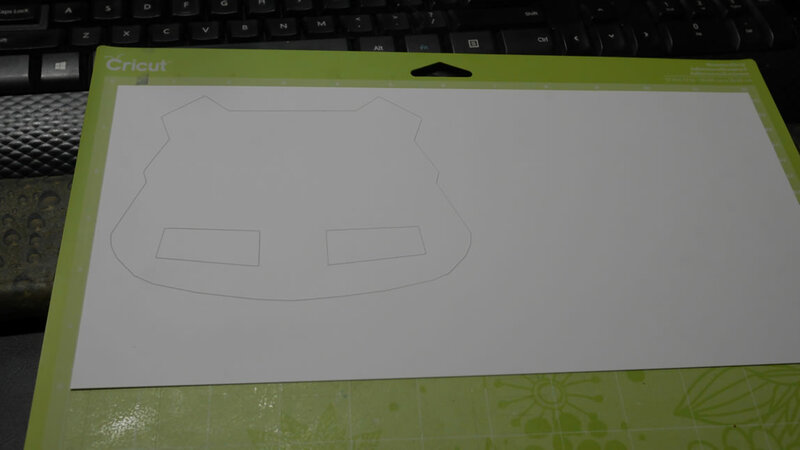 Rear skirt is drawn and cut on .4mm plastic. Here is a comparison to the original rear skirt. 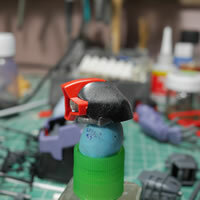 Clamps are used to hold the flat plastic sheet against the curvy rear skirt piece while the glue sets up. 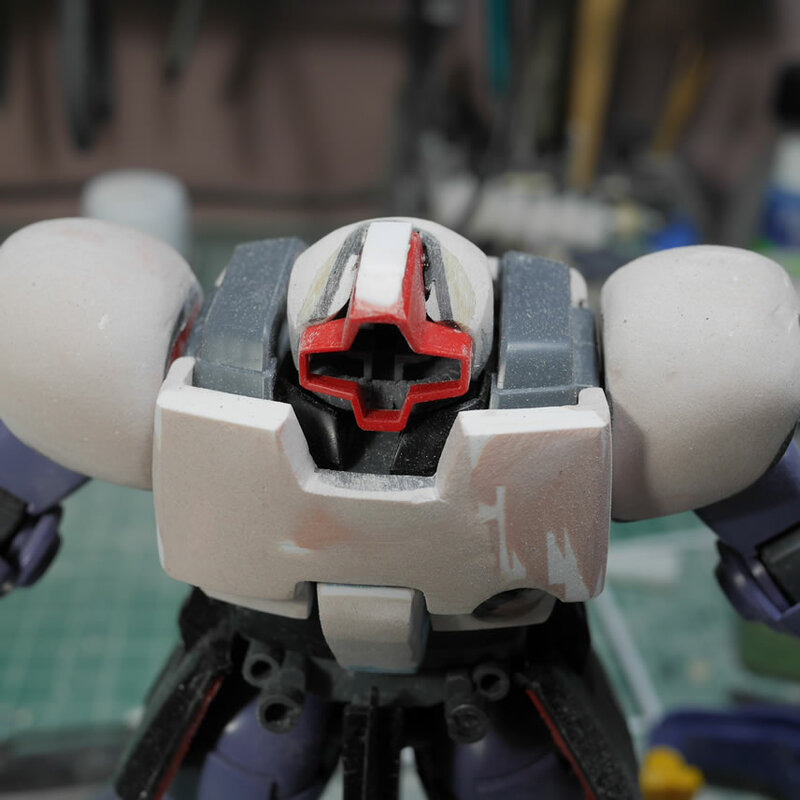 Very similar to how the front skirts were initially built. 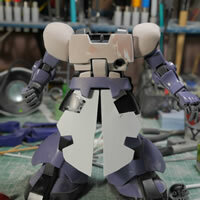 And here is what the project looks like so far. 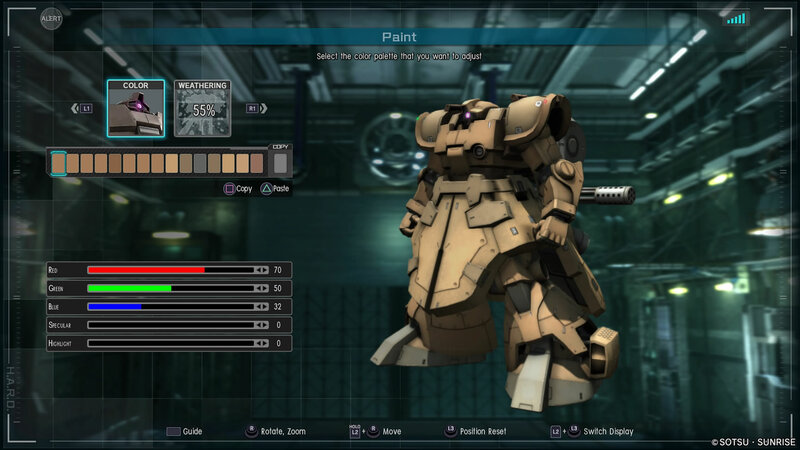 The adjusted gun design; the chest, front skirts, backpack and rear skirt. 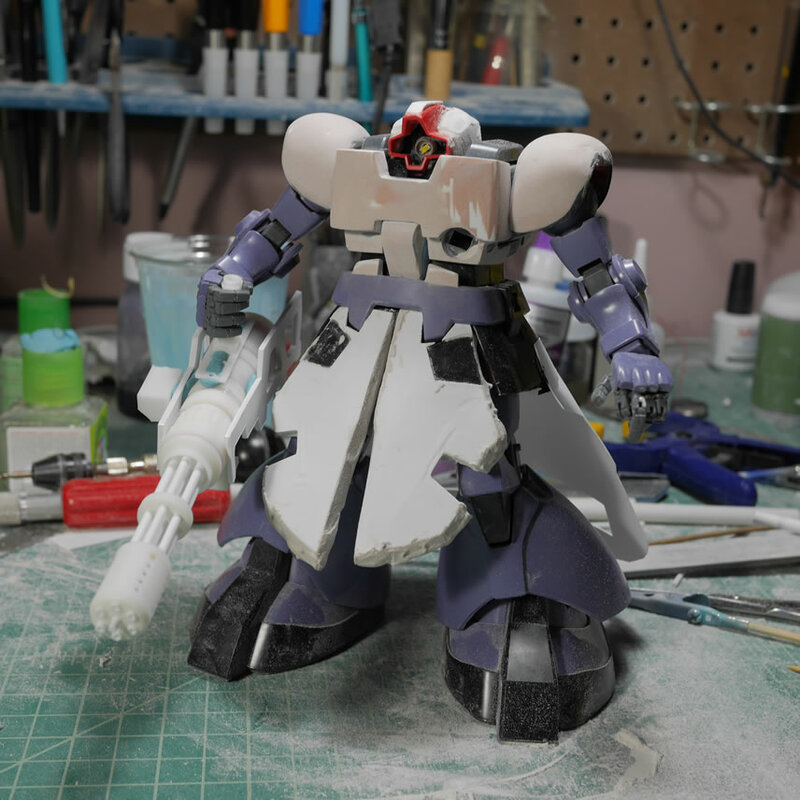 Not too shabby for about 2 weeks work of work so far.